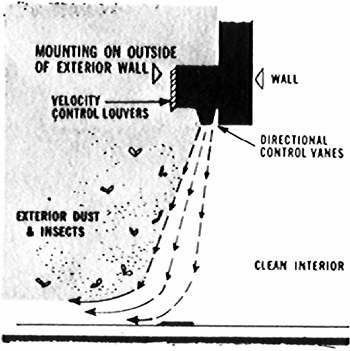 A stream of high-velocity temperature-controlled air which is directed downward across an opening; it excludes insects, exterior drafts, and so forth, prevents the transfer of heat across it, and permits air-conditioning of a space with an open entrance. a device in a local forced ventilation system for preventing the entry of cold outside air into an industrial space through open doors (or gateways) in industrial and commercial buildings. It consists of ducts with linear slots through which air is delivered by a fan with a velocity of 8-20 m/sec at an angle of 30°-45° to the face of the opening, against the stream of air tending to penetrate into the premises. Air curtains are also used at the enclosure openings of industrial equipment (to prevent the escape of hot, contaminated air into a room space) and in other cases where it is necessary to block off a current of air through an opening. The air supplied by the fan is often preheated; this type of unit (when used with an air preheater) is called a heated air curtain. A stream of high-velocity temperature-controlled air which is directed downward, across an opening; excludes insects, exterior drafts, etc. ; prevents the transfer of heat across it, and makes it possible to air-condition a space having an open entrance; used in exterior doors, on loading platforms, etc. The chemical-free air curtains from Berner International, based in New Castle, Pa.
For designs that include air curtains, they are generally created using a couple of linear slot diffusers with supply plenums, which, similarly, are designed to deliver air evenly over the length of the air slot. The corresponding air curtain velocities are measured by a Sierra-600 hot wire anemometer having an accuracy of 1% of the measured value in the range of 0-2 m/s (0-6. The airflow from the vertical air curtains was directed at a 45-degree angle across the doorway. However, flow field visualization tests showed that when more than one air curtain was operating, the curtain closest to the dissemination room showed some instability. The air curtain, an invisible wall made up of jets of air, has been used as a baffle to direct flow to a more desired path. Based on similar experiences following Hurricane Andrew, the engineering consultant supplied technical specifications on the operation of refractory type air curtain burners and air quality test results. The Walk-In cooler Efficiency Kit includes a pre-wired control/load center with enclosure, magnetic reed on/off door switch and a K-Zone air curtain that's engineered specifically for walk-in coolers/freezers, according to company officials. Having identified the need for the tools which enable identification of the performance of a tilted air jet, the objective of this present work is to develop a model-based design methodology for the establishment of tilted air jet plane, that will facilitate the design and or evaluate existing designs and in particular the effects of the inclination angle of the jet on the performance of the air curtain. Visualizing the OR as being negatively pressurized by means of exhausts covering all four walls would make it easier to picture just how an air curtain works. Biddle--the company whose research led to a breakthrough in air curtain technology--has launched a short film to highlight the problems associated with inefficient barriers between internal and external environments in coldstores. After a number of years of painstaking research, trials and in-situ improvements, the end product--an 'airwall'--has resolved the snags of conventional air curtain technology in this type of application.